The FT602 is a FIFO interface to SuperSpeed USB (USB 3.1 Gen 1) USB Video Class (UVC) bridge chip, which supports the streaming of video content from high definition camera equipment. This means that imaging systems which would have previously only been capable of delivering relatively low resolution material can gain substantially elevated video quality but still run at 60fps frame rates. Improved performance can be benefitted from while viewing captured imaging data via standard UVC enabled hardware and commonly used media player platforms (such as VLC Player). This ensures greater convenience - with minimal investment being needed to upgrade existing systems, or to design and deploy new systems from scratch. No custom drivers are required, thereby permitting straightforward plug-and-play implementation. 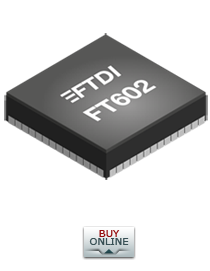 The FT602 series complements FTDI Chip’s existing FT60X series incorporating the FT600 and FT601 ICs, which presents development engineers with the industry’s most comprehensive USB 3.0 portfolio. These devices are capable of providing both USB 3.0 SuperSpeed (5Gbps) and USB 2.0 High Speed (480Mbps) interfacing. They each incorporate a 32-bit parallel FIFO interface for data streaming and a UART interface for control path configuration. Supplied in 76-pin QFN packages, they have a specified working temperature range spanning from -40°C to 85°C. Available in compact Pb-free QFN-76 RoHS compliant package.